You must make reservations at least 5 minutes in advance of the time at Tiny Lou's - Hotel Clermont. Complimentary valet for hotel and restaurant guests. Available 7 days a week with validation. 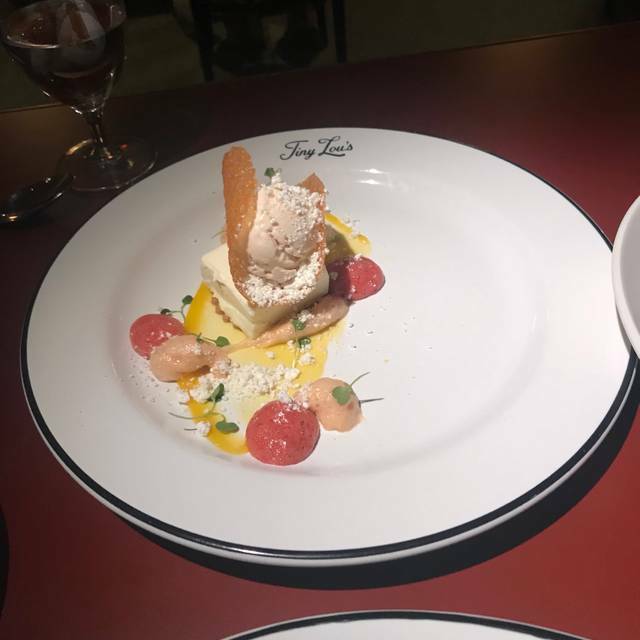 Within the walls of Atlanta’s forthcoming Hotel Clermont lies Tiny Lou’s, a 100-seat French-American brasserie led by executive chef Jeb Aldrich. 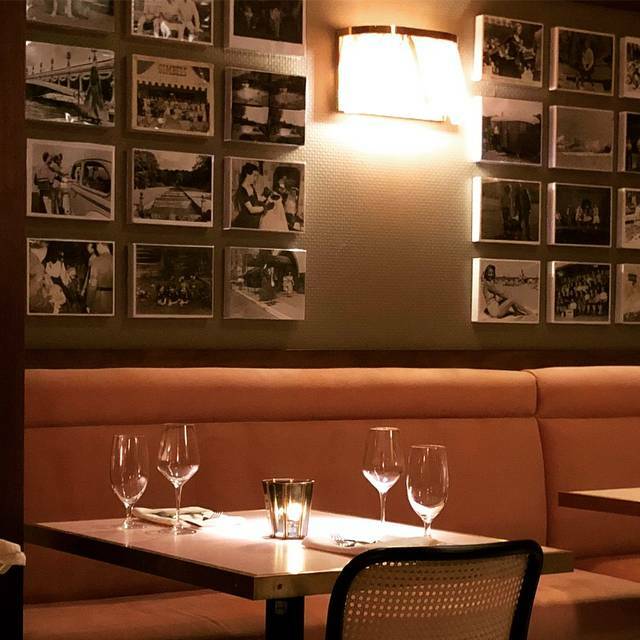 Operated by Indigo Road Hospitality Group, the French-remix presents a playful approach to French favorites, utilizing Southern ingredients and complemented by a Francophile-friendly wine list. I must say the food flavors were excellent but the meal was marred with issues. 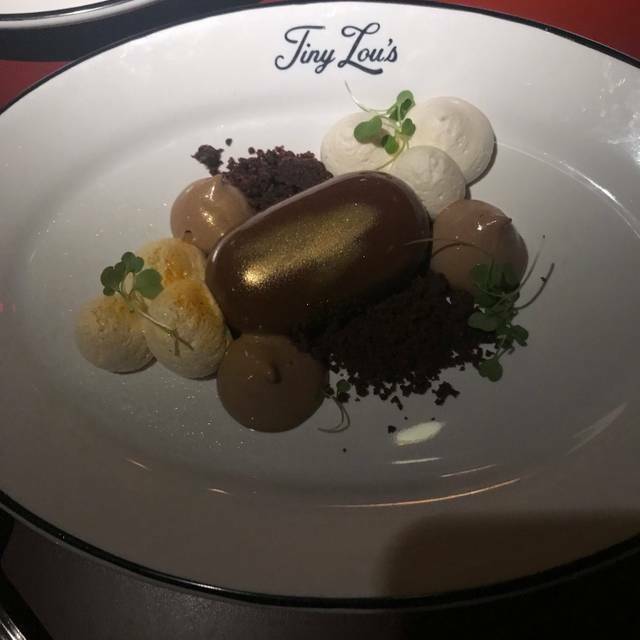 The service was very personable and professional but 1) ordered items were forgotten, 2) we were never checked on after food delivery, 3) the food was warm at best, 4) the check was wrong and after being promised comp desserts/replacement entrees/anything... absolutely nothing was done. 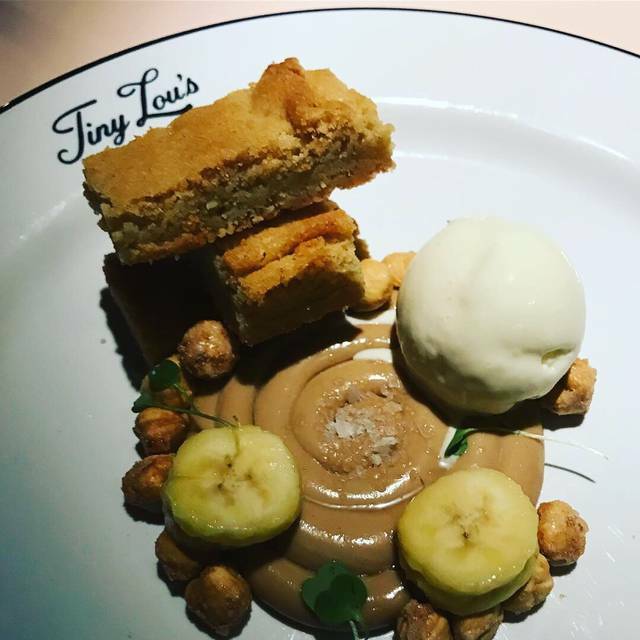 I'm not sure what the hype is all about but Tiny Lou's has the the potential to be a nice addition to the French food onslaught currently taking over the city. Maybe they need to concentrate more on the product and less on the fanfare. Went to Tiny Lou’s for brunch. Food was pretty good but nothing to write home about. Brunch was delicious! Had the French toast and a side of bacon. My friend had the Duck Confit and Waffles. The restaurant wasn’t really busy at noon on Saturday, so a reservation wasn’t necessary. Loud as hell - hard to have conversation when the restaurant is half full. Enjoyed the food, service and atmosphere though. Our service was amazing, our food was amazing, the entire experience was perfect. But Maddie, our server, was absolutely the best server we have ever had. OUTSTANDING! Food and service were both equally amazing!! Our server, Hailey, was a rockstar! William was an amazing server! Cannot day enough about him. We had a great time. Food was fantastic. Very enjoyable. The staff is very friendly and helpful. Food was outstanding. I would suggest to maybe staff an additional server/ more support staff during Sunday brunch. Our server was very pleasant and compitejt but certainly had her hands full. Love French food and this was a great brunch. My 5 year old grandson really liked the French toast and the kitchen was kind enough to substitute strawberries for the apples designated on the menu. The noise level was low enough that I had to tell my grandson to lower his voice which had gotten loud in his excitedness at the experience, not because of the noise of the restaurant. Excellent experience: satisfied the palate of the adults present and also satisfied the 5 year old. Absolutely a stunning place . Celebrated my best friends birthday. Top notch service and the food was amazing . 30 Layer Cake. Well, I didn't exactly count them, but I'm sure that number is close. The lemon crepe cake was awesome. 30+ layers of crepes sandwiched (creped) between layers of lemony cream with a strawberry drizzle on top. Yum. The scallop appetizer was delicious. 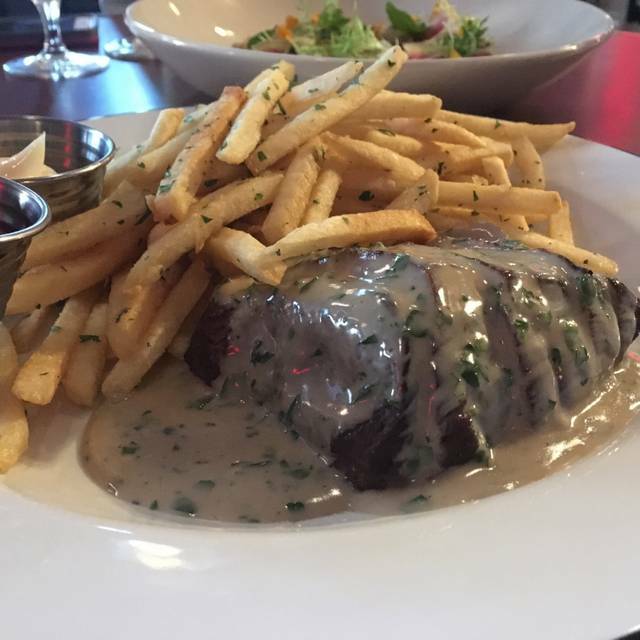 And the steak frites was perfectly cooked, tender and juicy, with the mystery Sauce du Clermont on top. Paying $5 for bread seemed a bit much considering the price of the entrees. The room is pretty and LOUD. Wait staff is excellent. Try it. You'll like it. And try to go early to drink in the view on the Rooftop. Wonderful atmosphere and delightful service. The food was amazing and this will definitely not be my last visit. Such a unique wonderful place. Great service, great food, great atmosphere. I took my husband here for his birthday. I cannot say enough good things about it. Service was excellent. Our server was very knowledgeable and honest. The food was absolutely incredible. The best food since our honeymoon where we dined at a 2 Michelin star spot. We had the steak tartare, the scallops, the octopus and the steak frites. All the food was spot on and the service was outstanding. Can't wait to go back and hang out on the roof. Our server, Dave, was a delight. Endlessly charming and just the right amount of attention to us! Delicious meal, and so creative! As a long time resident of the neighborhood I appreciate the restoration and refinement of the old Clermont Hotel. There is a nice mix of old and new that really works. Only negative: glitches in service. We waited for an hour to get our second appetizer while others around us were being served. And when the snails finally arrived it was obvious they had been sitting out for quite a while. But we will definitely go back - it's a fun experience! Came in for Moms birthday everything was wonderful except the desserts which all tasted stale and old. My daughter and I had a wonderful time. Our waitress Andrea was so friendly, knowledgeable about the menu and helpful. Definitely will go back again when in Atlanta. I hate places like this that are so full of themselves. I was staying in the hotel and just wanted a quick meal. I went down to the (empty) restaurant and was told I couldn't come in because "there's no space as we have lots of reservations coming in shortly". I went back to my room, logged on and reserved a table online, went back downstairs and they let me in without even having the decency to look embarrassed. I left an hour later and it was still empty. 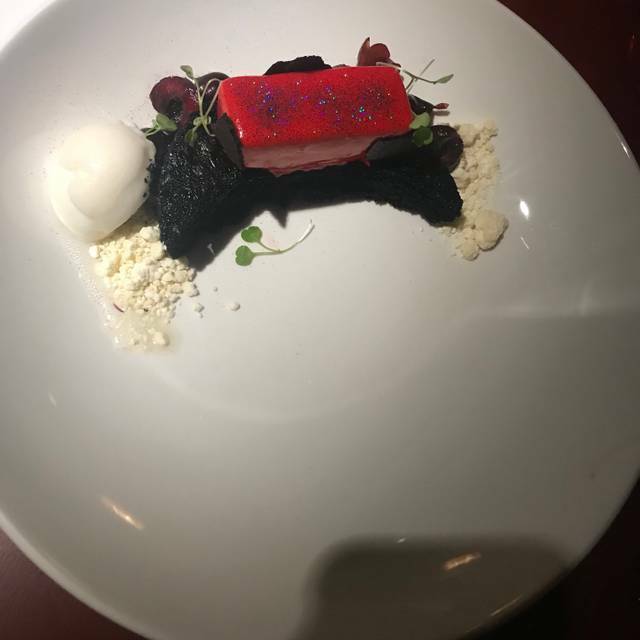 The food is pretentious and expensive. If you're staying at the hotel you don't have much choice but otherwise don't bother. Great food and atmosphere! Fun outing for our group. With the restaurant, lobby bar, rooftop bar and lounge it is a great evening in one spot. Highly recommend. Dining area was quite noisy, the AC unit was blowing the wall lamp shades. Informed Tiny Lou’s prior to arriving wife is a vegetarian and menu was very selective (they said they had multiple vegetarian selections not on menu and they’d inform the waitress to make suggestions) which they didn’t, the waitress suggested the Local Farm Egg Omelette, no thanks! 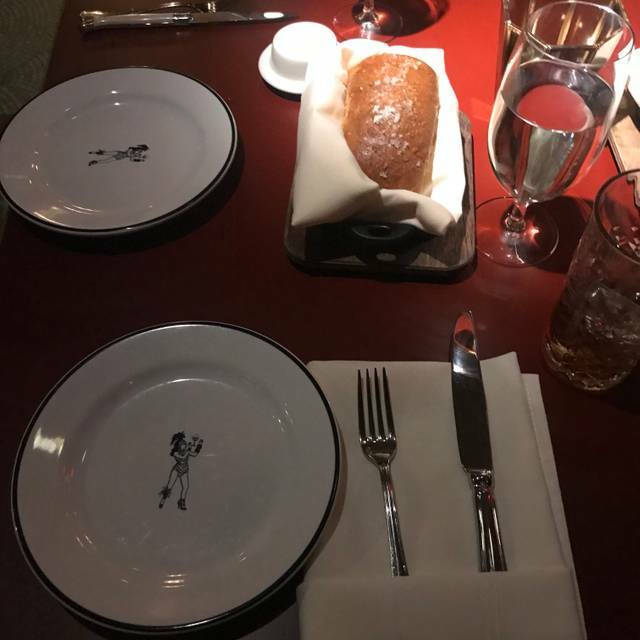 Overall, we went there to experience a great dinner (special occasion) and to check out the remodeled historic hotel, thankfully we got to experience the remodeled historic hotel. Great spot for a quiet date night. The octopus was great, and my husband's steak was perfect. I enjoyed the trout almondine. But the real winner was the 30+ layer cake at the end! Will definitely be returning to try more of this menu...and have the cake again. Tiny Lou’s exceeded our expectations. 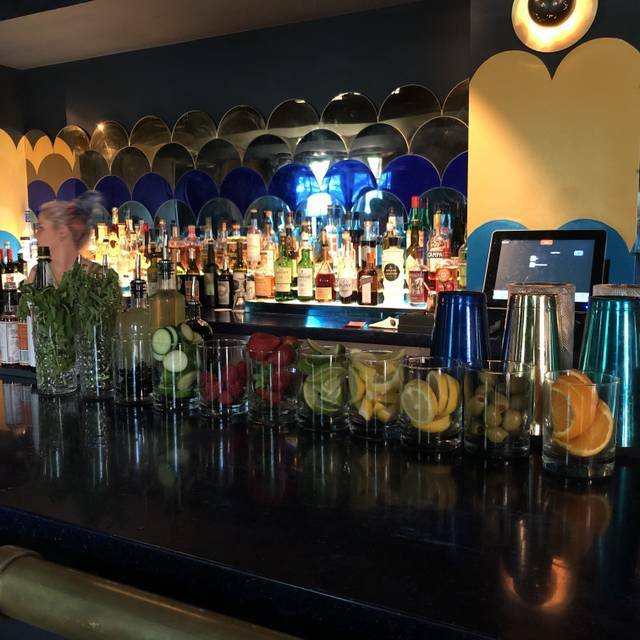 The delicious drinks, the amazing staff, the incredible food- you can’t go wrong. When we made our reservation, it asked what we were celebrating and we just got married a week prior so we put that. Upon being seated, we were given a greeting card signed by the staff congratulating us on our marriage. What a thoughtful gesture. Can’t wait to go back. We had four different entrees and I would eat every one of them again. Great personalized service. Everything delicious. Beautiful restaurant. A good meal out is an amalgam: the food, the drinks, the service, the ambiance, the pleasant surprises. A perfect meal is rare, and ours was not, but the response from TL's was perfect. We had a wonderful meal. The food was consistently fun, tasty, perfectly seasoned, but also consistently warm--even the plate that got the standard server "watch out, this plate is hot" warning. Wasn't. But we had a fine meal. We did mention that one concern to our server, in the context of "we had a great meal, only one thing we'd say..." To our surprise, the manager came by, apologized and comped ALL of the food. Not just a free dessert or a drink on the house. This is a commitment to excellence, and care over the customer experience that is rarely encountered. It's a sign that they are deadly serious about being a great restaurant. This place is a gem. We'll be back, soon. And I'll wager the food is hot. Exactly the kind of classic dining experience I was looking for, but still fun and current. My server, Kale, was great. She gave me an excellent and affordable wine pairing for my steak frites. Very cool space and excellent food, even the amuse bouche. Highly recommend. William was a big hit as was the f and b! Good food, great series, cute decor---super loud environment! Like so loud! But we were able to move into a small room off to the side so we could talk to the clients we were entertaining. Great restaurant! Drinks first in the upstairs bar were great, moved down to an awesome dinner! Great steak frites! Servers were accommodating, but it took forever to get our main courses and desserts. Some food items are way overpriced. 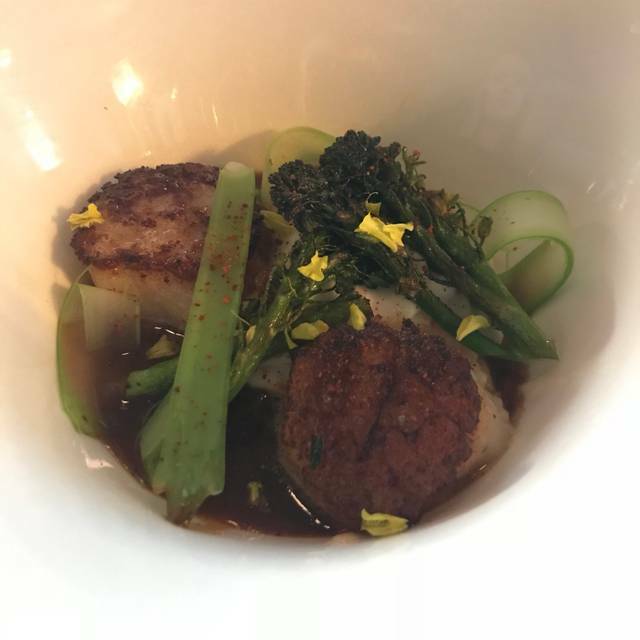 We paid 31.00 for 5 scallops as an app! They ran out of a couple of items, but went out of their way to provide a missing drink. The main courses were well prepared but one arrived improperly cooked. They were great about making it right. Overall, it’s a nice place, with good food, but needs some work on getting food to the table. Our new absolute fave. Duck consommé may be my favorite dish of the year. From the descending entrance from the lobby of Claremont Hotel, the whimsical neon sign that greets you, foreshadows the culinary experience you are about to enter upon. Tiny Lou’s delivers a well thought out food and beverage concept, with exceptional and well knowledged service. The fromage brûlée and crispy brussel sprouts were the perfect entry to whet our appetites. The pièces de ré·sis·tance was the pork schnitzel. Omg. We. Were. Speechless. Come one, come all to Atlanta’s newest and most amazing restaurant. Well done to all FOH and BOH for such seamless execution. Staff was wonderful. My girlfriend was given a hand written birthday card which she loved. Cocktails had fun names but did not wow me enough for a 5 star. The ambience is something from the elegant 40s via Casa Blanca wicker and tropical theme. Would come back again with a larger appetite.